Franchise Opportunities In Your Area! Join our sucsesful organization and start wearing red! Husse started in 1987 in Stockholm and is now the leader in home delivery of dog, cat and horse products under its own brand in Europe. We currently operate in over 45 countries with around 750 franchisees who daily deliver our products free of charge back to the customer. 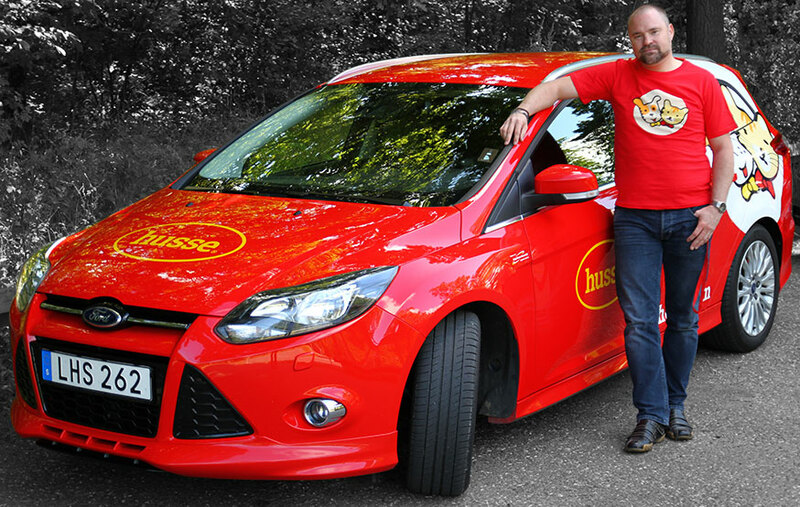 Our deliveries are made with Husse-branded cars. The business is based on the service of making it easy for the customer to own a pet! With our help the pet owner aviods carrying home heavy feed sacks and cat litter, and saves time by not having to go to the store to buy high quality products. Our customers can order online, email or telephone, and our local Husse distributors home supplies products on a date / time that is best for the customer. Masters concept has proved to work all around the world and since its beginings, nearly 30 years ago, Husse increased by about 25% per year. We have found new markets and taking more market share in the ever-growing segment of the canine, feline and equine products. And regardless the global, cultural and consumption differences. We hope this prospectus will give you an overall picture of Husse and do not hesitate contacting us directly by phone or e-mail. We will tell you more. Now we are looking for someone who is a positive and outgoing person with a desire to run their own business, who want to be part of a successful franchise chain and have the opportunity to start up their own business locally. Our system seeks efficiency, low costs, minimal administration and individual responsibility. We offer you the opportunity to start your own local company, with the same advantages as a global company. Contact us to see if there are vacant districts in your area. Who is to become a Husse franchisee? A typical profile for a Husse franchisee usually have some sort of sales experience and appreciate, above all, meeting new people. Because Husse is based on the "person to person" -marketing you need to enjoy being out in the field. While you as a franchisee operate and develop your local business based on your own work, you will also help growing the organization's performance and development. We will help you, of course, as a new franchisee, both to get started and develop. You get a basic introduction and ongoing training and support for product knowledge, nutrition, IT system, master's concepts, etc.